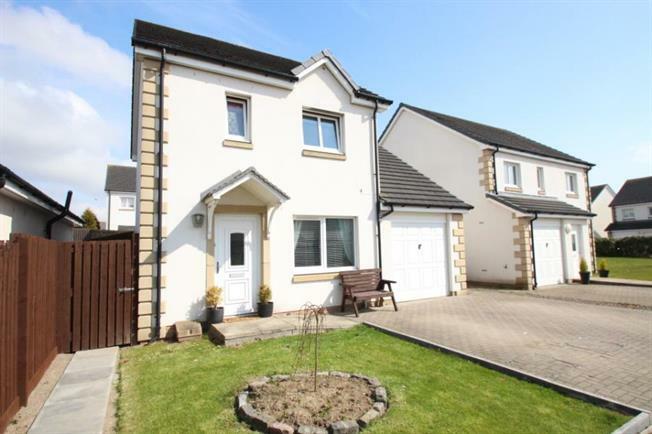 3 Bedroom Detached House For Sale in Leven for Offers Over £170,000. HOME REPORT VALUE 180,000 This lovely detached villa is located within a modern private residential area in popular Kennoway. Stylishly presented, the property offers generous sized family accommodation over two floors comprising of; welcoming entrance hall with window to side, storage cupboard, access to lounge and kitchen, stairs to upper level and with cloakroom/WC off. The lounge is front facing with French doors to dining room. The dining room is open through to the kitchen and also provides access to the utility room and French doors to the conservatory. The kitchen is fitted with base and wall units and integral gas hob, oven and extractor hood. The attractive conservatory has been added to the rear of property to provide further versatile accommodation and opens to the rear garden. The utility room is fitted with base and wall units, stainless steel sink with space for appliances, rear access door and further access to integral garage. Stairs lead to the upper floor landing and to three bedrooms and family bathroom. The master bedroom also benefits from fitted wardrobes and en-suite shower room. Externally there is a lawned garden to front with monoblock drive providing off-street parking for two vehicles leading to the integral garage. Paved side paths lead to the enclosed rear garden which has been landscaped to provide attractive seating areas, lawn and raised borders.